Just an old picture that my friend Don Parker had on his Facebook. It was taken a year ago, almost exactly, on November 18, 2007. 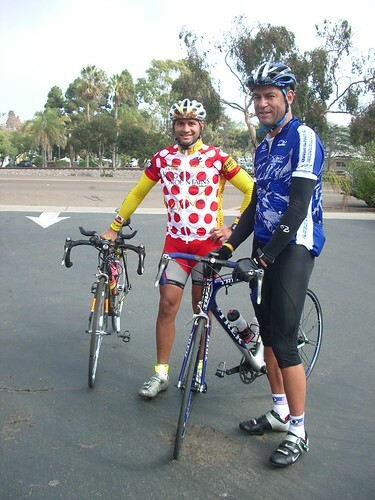 I was commuting home from Encinitas to Huntington Beach. I ran into Don going in the opposite direction and paused for a picture. I hope you all have a great Thanksgiving Day. I plan on riding but I just haven’t decided where yet. Have fun eat lots and enjoy the people you spend your day with!!! This entry was posted in friends, On My Commute by REV Cycling Directeur Sportif. Bookmark the permalink.